The 19-year-old pop star may be adored by flocks of teenage girls, but he isn't one to show off. 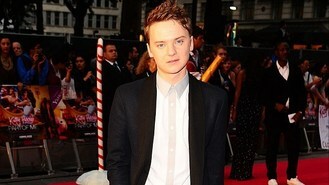 Conor told Top Of The Pops magazine: "Walking along the street, I'd normally rock a T-shirt. When you're in the street and you see guys with their tops off, it looks wrong. "Like, if there has literally been just one sunny day, you're like 'OK, maybe you should calm down, 'cause it's not quite summer!' On the beach, obviously it's all good." The Vegas Girl singer also revealed he is looking for love this summer. He said: "I speak to different girls and I go to different places with them. I suppose you could class that as dating. "But I am still completely single - I'm still looking for that summer love. I'm ready! I'm going to wait by the beach all day and if no one wants me, I'll just cry myself to sleep." Although girls may have to make the first move, as Conor also confessed he is not good at asking people out. He said: "I'm awful! I'm normally a person who knows what to say to girls. I'm confident in myself, I can make jokes and if I've just met someone, I can talk to them without feeling awkward. "But if I actually fancy someone, all that goes out the window and I become the biggest loser ever! I can't talk to girls if I really fancy them. I fail."